Vegetarian Vietnamese Banh Mi sandwiches are delicious, satisfying and very flavorful. Often times, you don’t even miss the meat. The vegetarian banh mi options are endless, but here is one Lemongrass Tofu Banh Mi recipe that is full of flavorful protein and healthy too. 1 pkg of firm tofu. 1 -2 stalks of fresh lemongrass. When chopped should be about 1/4 cup. 1. Drain Tofu and blot dry with paper towels to remove excess moisture. Slice into about 1/4 ” pieces. 2. Wash lemongrass and chop bulbs and remaining of stalk that is tender. Place chopped lemongrass in mortar & pestle and continue to crush pieces till they are small and pulverized. Add 2 cloves of garlic in mortar and crush garlic together with lemongrass. 3. In large plastic freezer bag, combine crushed lemongrass, garlic, vegetable oil, soy sauce, salt, pepper and sesame oil. Mix the marinade well, then add slices of tofu in bag. Lay tofu slices in gently on top of each other so that they don’t break. Make sure all marinate coats each slice of tofu. 4. Let marinade for at least 1 hour or until all tofu slices soak up the marinade. 5. Heat up frying pan. Do not add oil to the pan because the tofu is well oiled. Fry slices of tofu until both sides are golden brown with a nice firm crust. 6. Let cool and assemble banh mi. Use your choice of Banh Mi condiments from the Condiment List. 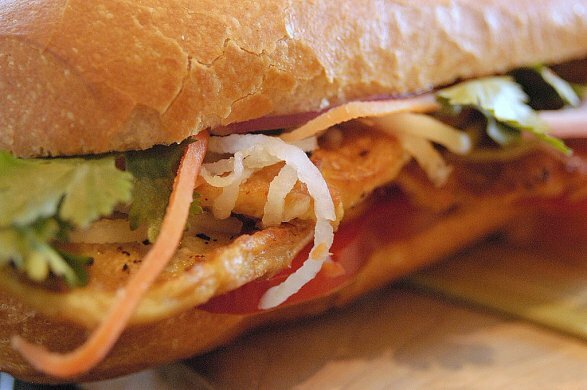 The soul of a Vietnamese bánh mì lies in the heart of the sandwich: the Việt style fillings. Here are a list of possible traditional offerings found in many local bánh mì shops. Can't make it to your local bánh mì shop often enough, or want to experiment with different fillings? Easy enough, make your own. Here we deconstruct the bánh mì and offer up a few recipes to play with for your fillings. Bánh mì are tasty and easy makes for your next party. Log in | 56 queries. 0.186 seconds.